The German company Multipower produces some of the best tasting protein powders, bars, and smoothies that I have tried to date. I have mentioned their huge 50 gram protein bar and quality protein powders in my two previous blogs 'Fuelling on Fat and Protein' and 'Five of the Best Drinks for Cyclists'; I have also used their products in recipes like my 'High Protein Banana Bread' and 'Protein Ice-cream' recipe. 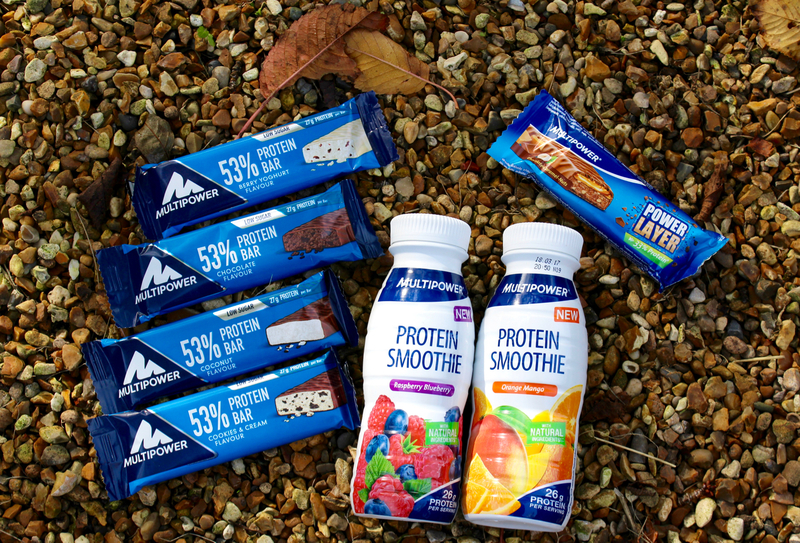 The Multipower products use quality ingredients, and have a more natural taste and texture than a lot of protein products on the market today. The huge 100 gram Multipower 50% Protein Bar packs a serious protein punch, and I found it to be an ideal recovery 'pudding' on my 'Coasts and Cols' tour. However, a 100 gram bar with 50 grams of protein, is quite a weight to eat; especially if you're only looking for a mid-afternoon snack - so Multipower have produced the new 50 gram bar, with 27 grams of protein. This smaller brother contains all the quality ingredients and taste of the 100 gram bars, but in a more bite size pack - ideal for recovering after a training session or race. I often find pre-mixed protein drinks are rather synthetic and un-natural in their taste; this fruit smoothie from Multipower bucks the trend. The flavour comes from real fruit, blended with UHT milk and whey protein; it provides a great taste and texture, for a protein rich drink. An ideal snack or post workout treat. I try to snack on nuts, rice cakes and dried fruit these days; but sometimes you really need a chocolate bar with your afternoon coffee... the Multipower Power Layer bar fulfils that sought after texture and satisfying taste of a chocolate bar, while also delivering quality protein. The Chocolate-Caramel-Nuts flavour I've tried, features crunchy hazelnuts, with smooth caramel and chocolate. Yet, it also provides you with around 20 grams of protein in each bar - so it will keep you sustained and satisfied for longer, as well as helping your recovery. This is like a healthy Snickers bar! Another great product from Multipower.